Still skiing! | Meghan Kelly Teles! The season really fizzled out in the Sierra, but I still had a great winter and progressed as a skier. Total stats to date – 121 days on snow, 70 at a resort and 51 backcountry, plus hoping to get at least one more on Shasta before the official end of the season. I threw a number of back flips and landed most of them to my feet though I would like more style and confidence. I passed my PSIA Level 3 Telemark Exam at the end of April in Mammoth, which I feel was a huge accomplishment. Despite the reputation of PSIA, the process has helped my skiing immensely and I am grateful to have “coaches” like Aaron Pearlman, Urmas Franosch, and Steve McDonald. Oh yeah… and I went skiing in Alaska!!! If what economist Malcolm Gladwell says is true and it takes 10,000 hours to truly become great at something, I’m not even halfway to becoming a great telemark skier. However, I can’t wait to see what the next 5,000+ hours bring (hopefully more snow and less carbon!). Here are a few photos from my recent ski adventures in the Eastern Sierra. Nicole had to drop in on one ski after accidentally dropping one down the couloir. Backcountry lessons. 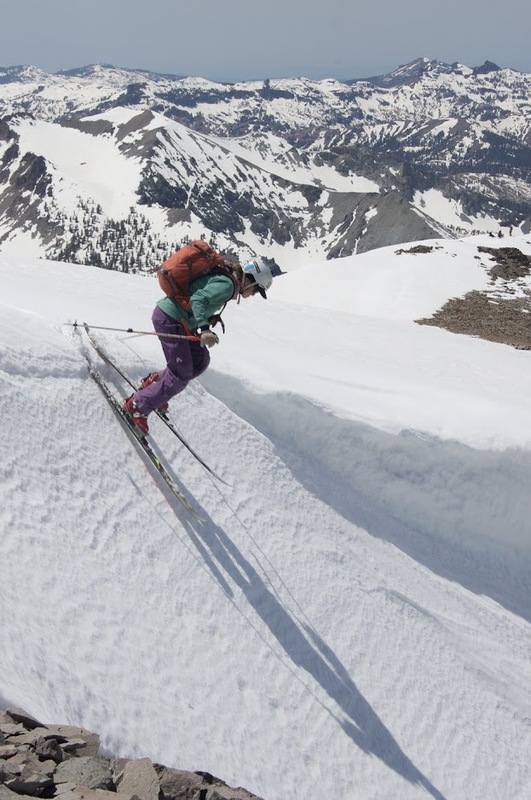 dropping into the Leavitt Y Couloir (Photo by Greg Marsden). Julie tearing up Tahoe in front of Mt. Tallac on May 12th!